Running in St. Louis, Missouri. Best routes and places to run in St. Louis. 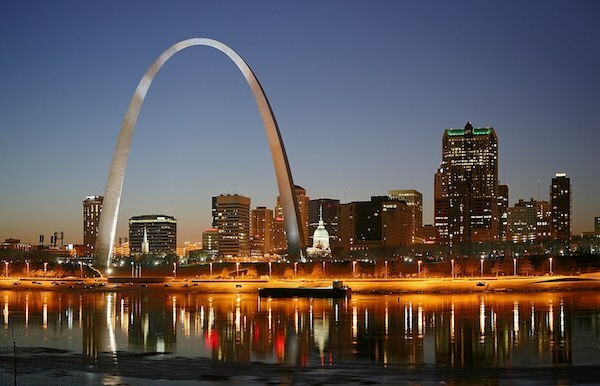 One of the more richly historic cities in the country, St. Louis lives up to its name as Gateway to the West. Due to its geographically central location and its relation to the Mississippi River, it became one of the major port cities and stops during westward expansion: Lewis & Clark’s expedition to explore the western territories started in St. Louis. The Museum of Westward Expansion is part of the Jefferson National Expansion Memorial Park, where the iconic Gateway Arch sits. St. Louis was also the site of the 1904 Summer Olympics, the first non-European City to host the events. There’s a good variety for running in St. Louis, from the historic Arch area, riverfront paths, and some signature parks. The signature run downtown incorporates the Arch, Jefferson park, and Eads Bridge. The Riverfront Trail heads for several miles north, with great views and bridge crossings. 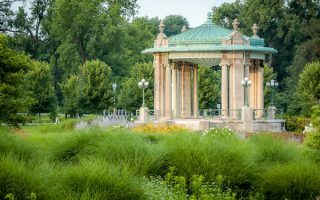 We also love Forest Park, which is one of the largest urban parks in the United States. 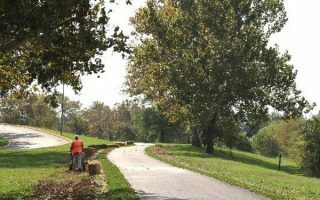 There are also some other great parks and suburban areas featured in our St. Louis running guide. Topographically, St. Louis is relatively flat. The surrounding environment are marked by slow rolling prairies, with moderate inclines. The Metrolink consists of the blue (MLB) and red (MLR) line. Running mostly parallel to each other, these lines can bring you to Forest Park and beyond. Upon arriving in the western suburbs, the Blue :ine curves south and west, whereas the Red Line continues northwest to the Lambert-St. Louis International Airport. The signature St. Louis run. Memorial Plaza, Gateway Arch, Jefferson Expansion Park, and other downtown landmarks in this 4.4 mile run. Can add Eads Bridge or the Riverfront Trail. A 6-mile loop incorporating numerous downtown sites, the Gateway Arch, Jefferson Expansion Park, Eads Bridge, museums, stadiums, and ballparks. 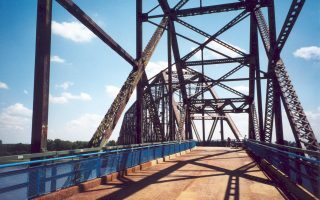 A bike path that goes for 11 miles to the Chain of Rocks Bridge, which is a pedestrian crossing over the river to the Illinois side. Loop options on each side of the river possible. Starts 1 mile from the Arch. 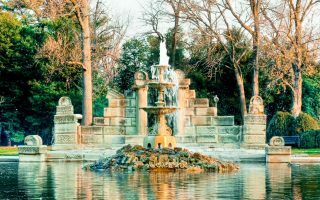 One of the largest urban parks in the country, and home to some major city attractions. This perimeter run will take you by Jefferson Lake and the Missouri History Museum, plus other landmarks. A few metro stops from downtown. 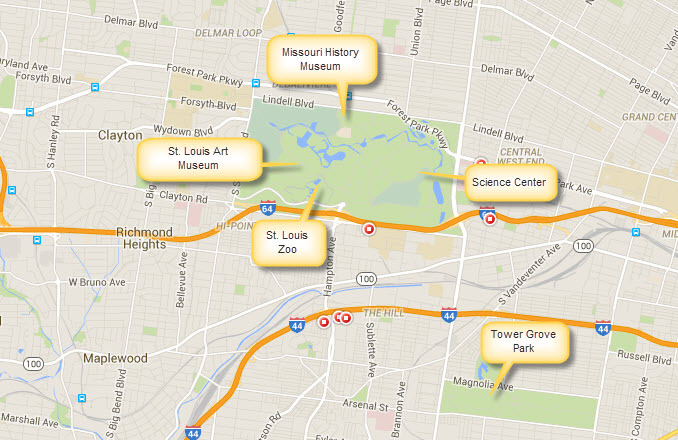 This route takes you by all the landmarks inside of the park, including the Emerson Grand Basin, the St. Louis Art Museum. Jefferson Lake, the Zoological Society, St. Louis Zoo, or cross the foot bridges over to Wildlife and Picnic Islands. 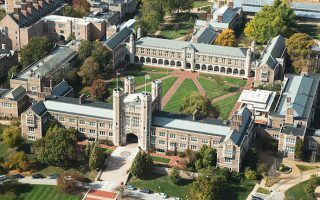 A classic route through the bucolic 'Wash U' campus and the tony Clayton neighborhood, which is a very pretty residential area. Includes the historic Shaw Park. We've created a 7 mile loop, but a DIY run in this area is also a great option. A 4-mile loop in around this small park close to downtown, running by the Missouri Botanical Gardens. There are many trails crossing the 300 acres of the park, with its 11 Victorian era pavilions. 39th st. nearby bounds a cool neighborhood for running. 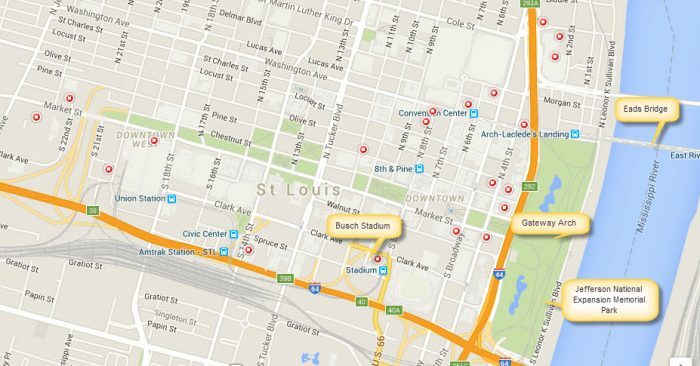 This is a link to the publicly available Half-Marathon route run by the St.Louis Track Club. Features Forest Park, Washington University at St. Louis, and Forsythe Blvd. out to Clayton. Nice suburban running. Two wonderful parks outside St. Louis: Queeny Park & Castlewood Park. Also, the Katy Trail, located near the airport, is a 250 mile trail across the eastern part of Missouri, and is a few miles from the airport. 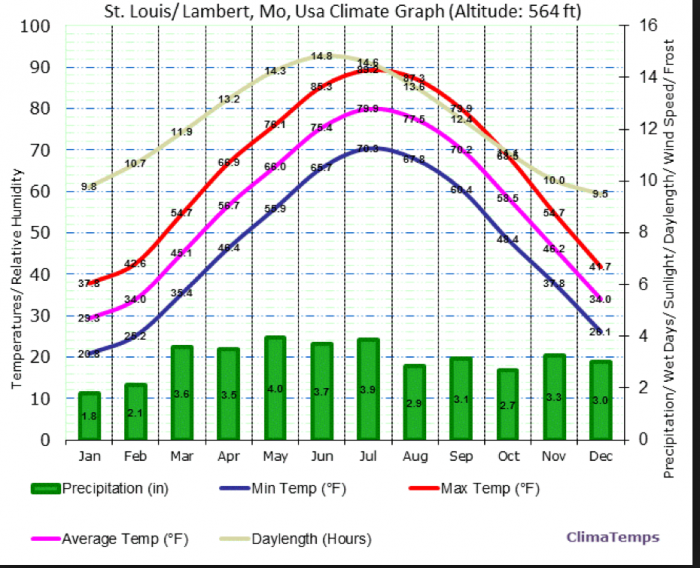 Without mountains or a large body of water to absorb or alter some of the weather patterns, the climate of St. Louis can swing from very hot and humid hot during the summer months to quite cold and windy during the winter months. Summers are hot and humid, with frequent thunderstorms. Winters are cold but not frigid. 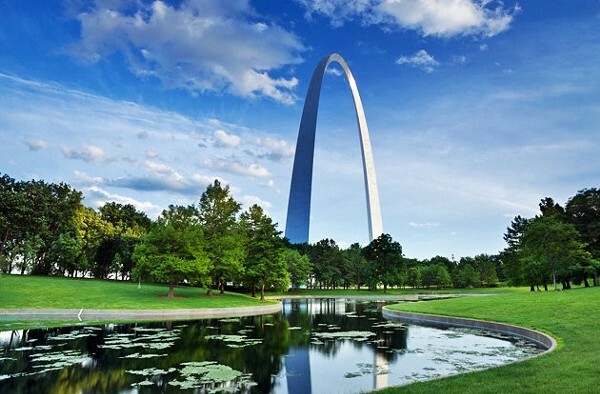 Most hotels are within a few blocks of the Gateway Arch and Jefferson National Expansion Memorial Park. The MetroLink Red Line provides stops from the airport to the downtown area. A few hotels are located near entrances of Forest Park due to the prevalence of tourist sites and landmarks, and the Washington University Danforth campus. Big River Running Company — Four locations: Near downtown St. Louis: University City and South City Shore; Outside: O’Fallon and West County Store. Group Runs: on Monday evenings, pub runs the third Wednesday of each month, Wednesday morning women’s runs from early spring until early fall; and winter running groups. 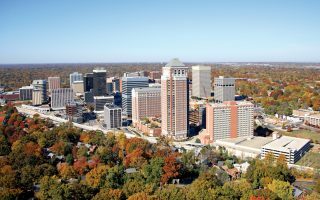 The Running Center of St. Louis — Located outside of the city in the nearby suburb of Rock Hill (approximately a ten minute drive west from Forest Park), the family owned operation has been in business for 33 years. True Runner — Located in the western suburb of Brentwood next to the Galeria Mall. Group Runs: Wednesday nights from the store with pizza available for all who participate. St. Louis Track Club — With offices located a few blocks west of Tower Grove Park (approximately two miles from downtown), the St. Louis Track Club is the area’s premier running group. 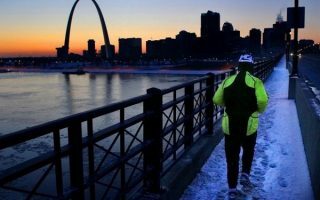 Hosting race series that encourage winter running, including the Frostbite Series and the Snowball Series, they also host one of the The St. Louis Half Marathon, benefiting the Special Olympics. 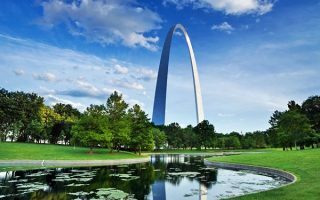 St. Louis Running Tour — Marketed as the first and only running tour of the city, the St. Louis Running Tour is a running tour of the landmarks of the city. Running for all paces, guests have two options: downtown or The Hill neighborhood, also known as the traditional Italian neighborhood. Race calendar, from St. Louis Track Club. Mercy Go! St. Louis Marathon. April. Formerly known as the Spirit of St. Louis Marathon, this event has been held every year since 2000. PNC Bank Go! St. Louis Half Marathon — Held at the same day and time as the full marathon. Cowbell Uncorked 100K Relay. Held every May in Augusta, MO, this off-road relay is a 15 mile drive west of St. Louis. Teams of five or two (a new option for 2016) run 62 miles, with three separate loops of 10K and two different 5K’s. St. Louis Half Marathon. November. Held in November, this local independent race is hosted by the St. Louis Track Club. Starting and ending just outside the city, the course takes you into Forest Park, winding through small hills and trails. Proceeds benefit the Special Olympics.